Full Health before any battle among other Ammunition is the main possibility to survive in the Evolution: Battle for Utopia game. 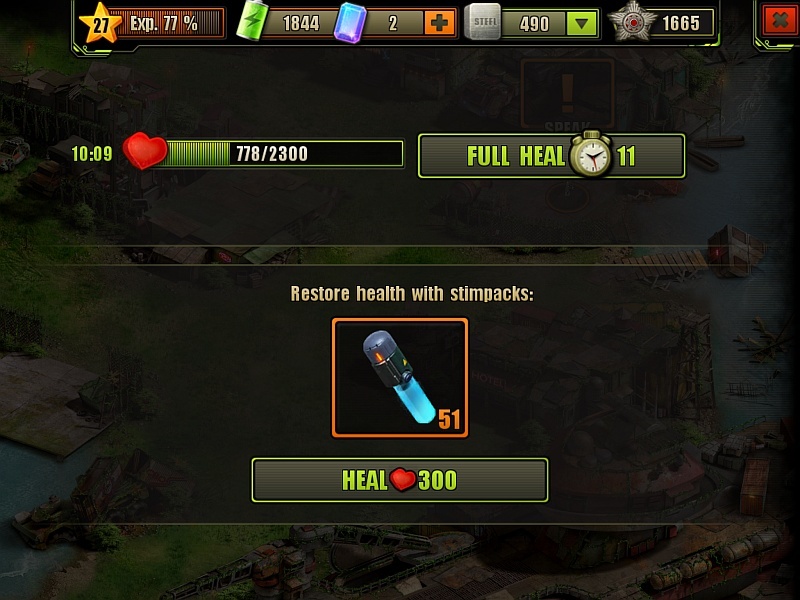 Medpacks heal your Health points during regular and PvP battles. And Stimpacks uses to quickly regenerate health outside of combat. You can’t attack anyone if you current health is below 50% from it’s maximum. In case you’ll try, the game offers you to use stimpacks, time points, gems or wait to regenerate your health at least to half. All medpacks, regardless of type, share a cool-down timer; which keeps you from using another medpack for 25 seconds after one has been used. 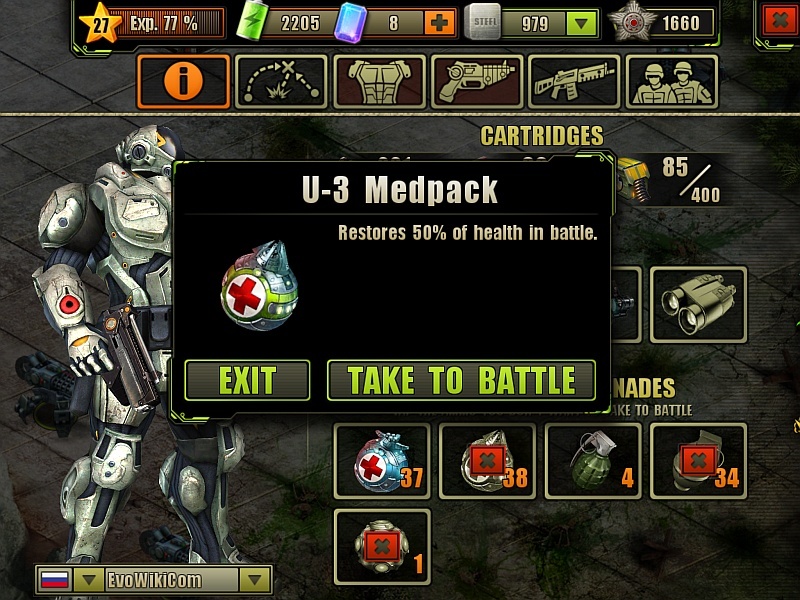 You will automatically use the lowest level medpack (from your inventory) when you health goes below 30%. To keep some valuable U-2, U-3 Medpacks you have during easy combats, you can tap on them in your profile screen and don’t take them to these battles. Each Medpack Kit, contains of 8 pieces (but each Grenades Kit only of 6). Save your at least for U-2 Medpack Kit, rather more useful then U-1 Kit. Do You Want to Take U-3 Medpacks to Next Battle? Is it worth to research the U2 Medpack kit? I’m at level 33 (by now) and U3 Medpack kits will only be available at Black Legion. So, should I go for U2’s??? Deffinately, because the U-2 Medpacks don’t demand Crystallite to produce it! U1 is already done. But haven’t used it since the research of U2. I’ve already unlocked U2 Med Pack kits and also G2 frag grenades kit. Yes but when you are in fights that you know that you are going to get a lot of damage, you need the better medpack you can have, right? For instance when fighting turrets that are abouve Hydras… And also need G3 grenades or I won’t be able to defeat Hydras! What’s your level, and what weapon do you use? And what’s your position in the story? Maybe, we can give you a few good advices. I am 33 now, Hydras and Black Hydras are not a problem with G2 grenades and U2 medpacks. Weapon: UFO pistol with full upgrades. In fact, I use U3 medpacks only for very powerfull enemies. Such as Mammonth tank or Maximus turret. Really??? I think I really need some advices. I’m also at 33, but don’t know the answer to “my position in the story”. I’m using Storm AR (fully upgraded) and Dragon (fully upgraded). I don’t have UFO pistol and my Acid Pistol has no upgrade because it is weak in damage so I haven’t upgraded it. Maybe a mistake, no? What about Hydras, you should look at this video. The Commandor in this video have just stormtrooper armor, 600 HP less then your Prometheus. Having a Prometheus, you have all chances to defeat Hydra turret. You have a problems because you just don’t have an instrument against armor. At your position there are three ways to resolve the problem. 1. Upgrade your Acid pistol. Use aimed shot when turret starts an attack (it becomes red). Aimed shot stops an attack. 2. If you want to visit a Secondary story locations, you can go to the Swamps and hire Rico. He has an acid shotgun, very usefull against armor, but having only 30% damage at long distance. But it’s better then nothing. 3. If you have game currency (jems), you can buy an M3 pistol. It’s damage is good (like as Cobra) against live targets and 50% demage against armored enemies. Black Hydras are not a problem as I have a Spartan armour. I just didn’t go to the secondary story locations before UFO’s Crash. Ok, Aimed shot just before a turret attack it’s probably a good tip. Do you think It’s wise to upgrade my Acid Pistol at this stage??? I mean at level 33, do you think it can still make the difference? Our partner always shoot to the same enemy we are shooting, right? It’s not possible to make our partner to shoot one enemy while we shoot another, right? If you don’ t want to buy the M3 pistol, upgrade of acid pistol is a good choice. You’ll meet more and more armored enemies on your way. The partner always shoot the same enemy. You can only tell him when to reload weapons. I’m not going to buy M3 pistol because it is way weaker than Dragon’s. I’ll upgrade my Acid Pistol! Now I’m getting along with taking out Hydras turrets with Acid Pistol and that tip of yours about Aimed shots to stop the next turret attack. Specially this tip is making huge difference. I’m at level 41 and have unlocked the Cristalyte deposite yesterday. I also rob the merchant and already collected 67 U3 Medpacks and 77 G3 frag grenades from him. I will buy the U3 Medpacks. They will be very useful later in the game, for sure! They were handy when defeating Maximus Boss at the end of Black Legion Base! U2 medpacks have less price and you’ll use it more often. But U3 are usefull against bosses and in PVP. Sure, you can produce it without having a kit, but that takes more resources and it’s sooo annoying to make it one by one. How much is the cost to produce U3 Medpack Kits and G3 frag grenade Kits? (I’m not asking the cost to research and produce the tech, but the items themselves). When we are in battle and if we click on a Medpack icon/button while in cooldown timer, a check mark is added to the icon/button. Does this check mark means not to auto-use that Medpack when under 30% of health or it means exactly to auto-use that Medpack when under 30% of health?? I haven’t understood it yet! I’m pretty sure it’s to specify to use that med pack. So if you had U2 and U3 med packs, by default it would use a U2 med pack when you drop below 30%. If you put a check mark on the U3 med pack, then it’ll use the U3 instead of the U2 when you drop below 30% health.